Watsonians continued their climb up the BT Premiership table, leapfrogging yesterday’s opponents to occupy a play-off berth after taking all five points from a match that was played at a furious intensity. 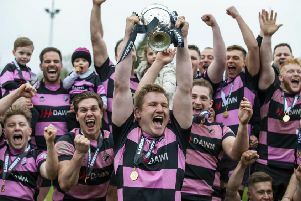 While Heriot’s contributed to their own downfall with a string of errors, the result was further evidence of the progress the Myreside outfit has made since Steve Lawrie assumed coaching responsibilities. It was a second successive defeat for Heriot’s, whose coach Phil Smith pointed the finger squarely at his own men. The final outcome had looked unlikely as the hosts struck inside the first minute when Robbie Mulvena took advantage of uncertainty in the opposition ranks to seize on a loose ball and sprint over for an unconverted try. Watsonians struck back with a penalty from Ali Harris before Heriot’s bagged a second score when Tom Wilson launched a well-judged kick down the right wing and Charlie Simpson won the race for the line. With little more than ten minutes on the clock the visitors squared matters. Simpson made a try-saving tackle on Michael Allen and the recycled ball was slung along the line to Michael Fedo who dotted down, with Harris adding the extras. Watsonians took the lead when Jason Harries touched down in the corner and Harris converted but that advantage was short-lived and Heriot’s were back level after half an hour when Jack Turley drove over after a close range lineout. By half-time, Watsonians were back in front after Rory Hutton darted through a gap and Harris again converted. The advantage grew within two minutes of the restart when a spilled ball was hacked through and Mark Bertram was on hand to finish off and claim the bonus point. Heriot’s squandered several scoring opportunities before falling further behind when Harris hammered over a penalty that extended the gap to more than two scores. Heriot’s were reduced to 14 men when the French referee showed Michael Liness a red card for a stamp, and the home side’s misery was complete when DJ Innes profited from defensive disarray to dart in, then Hutton intercepted a looping pass to race over, with Harris converting both.